The two longest journeys of the season have been left until our last two away games at Bournemouth in two weeks time and Crystal Palace to come before that tomorrow tea time. It’s not just a long trip but probably the most difficult by road and I’ve certainly experienced some difficult trips there and back over the years. Still waiting for our first away win of the season, this is the first of our last two chances to put that right, but of far more importance is the need to get the points required to ensure we remain in the Premier League. What had looked a comfortable task a few weeks ago has now left some getting edgy with Swansea, in 18th place, just five points behind us. We’ve been told constantly this week that we’ve won only once in our last eleven games in the Premier League. That’s very much a fact, but seven of those games have been away from Turf Moor and three of the four home games were against Chelsea, Tottenham and Manchester United, three of the teams in the top five. The other home game against Stoke was won. Just five points it is, but five points is significant at the bottom end of the league with only four games remaining. Should Swansea have a good end to the season, say win two and draw one of their games, it would take them to 38 points, just two more than we have now. That suggests one win would be more than enough to ensure safety, but, you never know and we just need to get the points as soon as we can. Last week James Tarkowski got his first Premier League action in the centre of defence, coming on at half time for Ben Mee, and with doubts over Mee’s fitness tomorrow he could get his first league start since we won at Bolton in March of last year. There’s every chance he will get that start and Sean Dyche will certainly have to make one other change with midfielder Joey Barton now suspended. Joey made his 58th appearance for us last week against Manchester United, but with this week’s news from The FA it is almost certain that it will have been his last in our claret and blue shirt with Ashley Westwood the obvious replacement. Sam Vokes and Scott Arfield are both back in contention and the news on Stephen Ward is good. Should Mee be ruled out and there be no other changes, the team is likely to be: Tom Heaton, Matt Lowton, Michael Keane, James Tarkowski, Stephen Ward, George Boyd, Jeff Hendrick, Ashley Westwood, Robbie Brady, Ashley Barnes, Andre Gray. Subs from: Nick Pope, Jon Flanagan, Kevin Long, Scott Arfield, Steven Defour, Johann Berg Gudmundsson, Sam Vokes, Dan Agyei. Crystal Palace were beaten 1-0 at home by Spurs on Wednesday. It was their first home defeat since an astonishing 4-0 reverse against Sunderland at Selhurst Park on 4th February. Since , they went on to win three and draw one at home before the Spurs game. The last of those wins was a comfortable 3-0 victory against Arsenal and in recent weeks they’ve also picked up maximum points three times in the last four games, two of them at Chelsea and Liverpool. When Sunderland beat them, it left both clubs on 19 points and in the bottom two places. At the time we were 12th with 29 points, but their form has been incredible since with Sam Allardyce once again engineering what looks like an escape from the clutches of relegation. Prior to Wednesday they’d won 19 points from eight games. Christian Benteke has been a major goal threat for them. He’s scored five goals in April to take his total to 14 while Wilfried Zaha is their second highest scorer with six. If Palace do have a problem tomorrow it is in defence. Scott Dann hasn’t played since the win at Chelsea while James Tomkins missed the Spurs game. Both are ruled out tomorrow as is Mamadou Sakho. On loan from Liverpool he was stretchered off with strained knee ligaments against Spurs and is expected to miss the rest of the season. Martin Kelly and Damien Delaney are expected to play at the back for Palace. Their team could be: Wayne Hennessey, Joel Ward, Damien Delaney, Martin Kelly, Patrick van Aanholt, Andros Townsend, James McArthur, Luka Milivojevic, Jeff Schlupp, Wilfried Zaha, Christian Benteke. 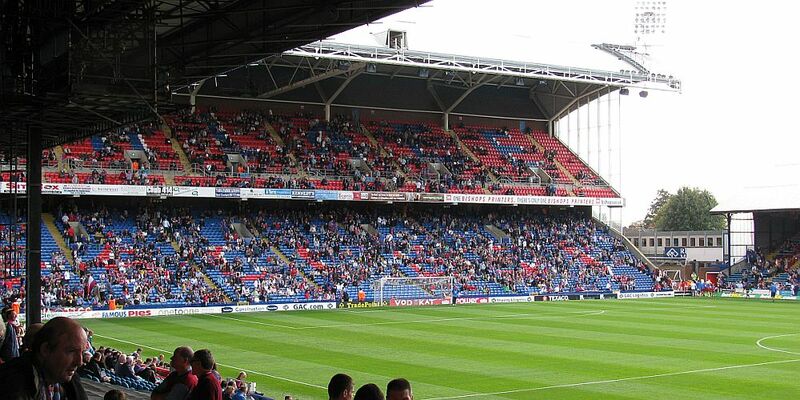 Subs: Julian Speroni, Mathieu Flamini, Zeki Fryers, Yohan Cabaye, Bakary Sako, Fraizer Campbell, Jason Puncheon. It was September 2014, our fourth game of the season. We’d picked up just one point from the first three with a 0-0 home draw against Manchester United and we faced a Palace side who had fared no better, their one point coming in a 3-3 draw at Newcastle. Burnley had made three signings since that last game, two of them on loan. The loan players Michael Keane and Nathaniel Chalobah weren’t included but Palace fan George Boyd, signed from Hull, went straight into the team in place of Matt Taylor who had suffered an achilles injury which would keep him out for much of the season. Palace started the better of the two teams but as the half progressed we came more and more into it although we suffered a blow just before half time when Danny Ings, who had been yellow carded for simulation, was forced off with a hamstring injury. It was much better from Burnley in the second half when we caused them some problems with the strike pair of man of the match Lukas Jutkiewicz and Marvin Sordell who were ably supported by David Jones and Scott Arfield, both in excellent form. With six minutes to go we got our chance when Mike Jedinak fouled Boyd. Mike Dean didn’t hesitate in pointing to the spot but, very surprisingly, took no action against Jedinak who had already been yellow carded. Arfield grabbed the ball to take his first ever penalty for us but Julian Speroni, so often the scourge of Burnley, made a magnificent save to keep it out. We should have had another penalty two minutes later. This time Dean couldn’t have seen it but his assistant had the clearest of views, choosing not to flag and that was it, a first away point of the season and we went two places up the table from 20th to 18th. Crystal Palace: Julian Speroni, Adrian Marriapa, Scott Dann, Damien Delaney, Joel Ward, Jason Puncheon, Mike Jedinak, James McArthur, Wilfried Zaha (Yannick Bolasie 69), Fraizer Campbell (Jonny Williams 75), Dwight Gayle (Kevin Doyle 61). Subs not used: Wayne Hennessey, Zeki Fryers, Joe Ledley, Martin Kelly. Burnley: Tom Heaton, Kieran Trippier, Michael Duff, Jason Shackell, Ben Mee, Scott Arfield, Dean Marney, David Jones, George Boyd, Danny Ings (Marvin Sordell 42), Lukas Jutkiewicz. Subs not used: Matt Gilks, Steven Reid, Kevin Long, Stephen Ward, Ross Wallace, Ashley Barnes.